France, 1944. 12-year-old Eloise’s father has not come home in over a week, and she is getting worried that something might be badly wrong. When the Germans occupy Eloise’s town, and the Nazi Kommandant moves into Maison de la Noyer, things start falling apart. Through a chance meeting, Eloise volunteers to join the Resistance. Suspense, secrecy and danger follow her as, inspired by her favourite detective fiction books, she tries to find her father. A hidden passage behind a tapestry, a deportation list and a race against time… Will Eloise find her father? And what other secrets will she reveal? I received this towards the end of the summer and have been meaning to get to it for ages and now I've read it I instantly regret having not got to it sooner. 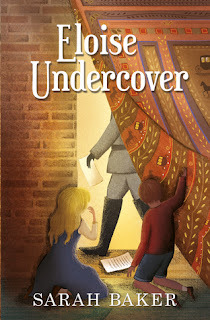 Eloise undercover is the perfect read for older children and younger teens with an interest in WWII history. The story focuses on the resistance movement in France and I was thoroughly gripped by Eloise's story from the first page. I loved following the story as it unfolded and couldn't wait to see where it went. I loved it myself but also loved it because it will be one of those books I can happily recommend to students at school to my year 8 students looking for wider reading because it is engaging and the history in it is really good.